Over 50% of US households will be Amazon Prime members this year, according to eMarketer—5 million more households than last year. Following this new market trend, half of all furniture sales have moved online. How can brick & mortar retailers compete with this shift? Floor experiential “try before you buy” product, something that will excite buyers to come in and try because they can’t evaluate it solely by studying online photos, dimensions, descriptions, and reviews. FFL Brands protects our retail partners. From our strict UMAP policy that creates an equal playing field to geographic and demographic market protection. FFL also supports our dealer network through a strong referral system including all of our branded websites as well as our internal team who are rewarded more for referrals than sales. Your success is our success and we go to great lengths to make sure you are set up to succeed. Another development in the massage chair industry is that one of the largest national brick and mortar retailers, Brookstone, is no more. This has left a large vacuum in the industry with consumers that do not have locations to try and purchase chairs. We’ll help you get your slice of this underserved market. Brookstone reported 2017 sales of $351 million, down 33 percent from 2016. While 60% of their traffic was in their stores, their web sales dropped when they discontinued their hard-copy catalogs. And in our estimation – and our data is pretty good – Brookstone sold about 6,000 massage chairs a year even as the rest of their business was in collapse. Though there were a lot of factors that lead to their failure, consider it your opportunity to fill the 6,000 chair void. Create a reason for your customers to visit your store by offering a new product line that supports wellness. Traditional retail continues to die, so don’t be traditional– think outside the box, offer something new. Drive store traffic volume with a high margin, low square footage commitment. Brookstone commanded the niche market for massage chairs and tech gadgets located in strip malls all over the country. They filed for Chapter 11 in 2018, blaming declining mall traffic, management turnover, supply chain and technical problems. Over 100 stores closed, creating a huge vacuum in the massage chair market that’s still waiting to be filled. Consumers are looking for ways to include healthy relaxation and combat stress in their daily lives. But they may not know that massage chairs can improve their comfort, health, and happiness. Massage increases blood flow, reduces soreness or joint pain, and helps people feel better. 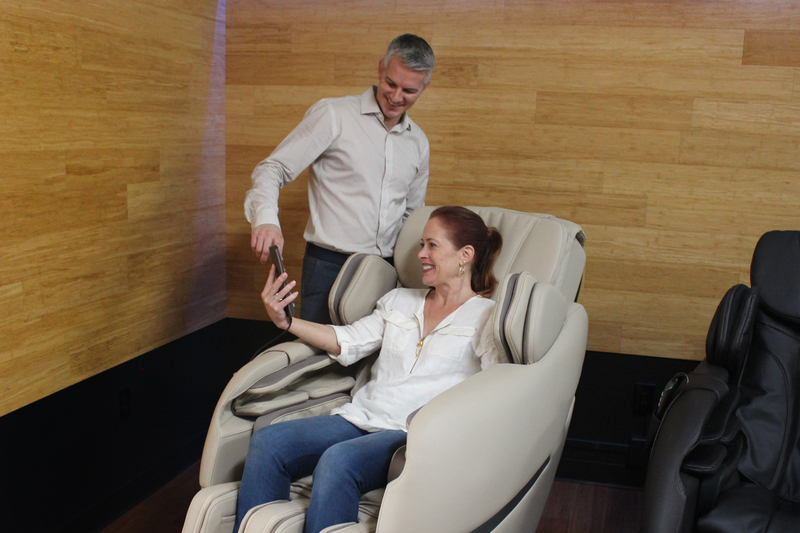 Once they try a great massage chair in your store, they will understand its benefits. Online sales retailers can’t touch that. And the cheap knock-offs featured there just don’t hold a candle to the highest quality massage chairs available in the market today that you can floor in your showroom. Capitalize on this opportunity and make your store the destination for customers interested in high quality wellness products. Massage chairs are a high-margin, high-value proposition to improve the vitality and health of your customers and your business. Why choose FFL Brands as your massage chair partner? Simply put, we are the company that established the luxury massage chair industry in America. And we put our money where our mouth is by designing, manufacturing and supplying the very best products. We stand behind what we sell with exceptional service. We understand the demands of retail and support our dealers to be successful. Why do business with FFL Brands? FFL Brands recognizes how tough furniture retail can be. We don’t just sell chairs. We offer ourselves, our services, and our products to you in hopes that we can build a lasting and productive business relationship together with you. If we do this right, you’ll benefit, we’ll benefit, and your customers will be delighted with the FFL product they chose. In summary, we offer you a business model built to help you succeed. We’re healthy when you’re healthy!